VIII. ADDITIONAL INFORMATION EXPLANATIONS. (lndicatepartofReport.) 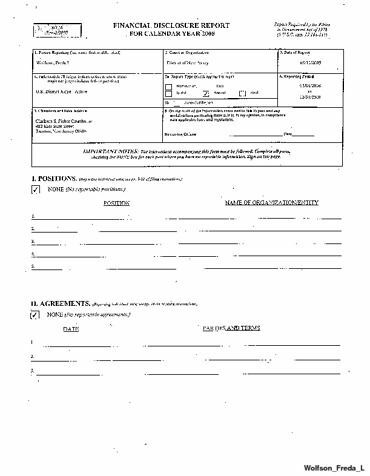 Item Number Section VII (Investments and Trusts) -this final zero coupon bond was inadvertently omitted from last year's (2007) Financial Disclosure Statement. matured and was redeemed June 16, 2008. have included this year's Statement. certify that all information given above (including information pertaining spouse and minor dependent children, any) accurate, true, and complete the best knowledge and belief, and that any information not reported was withheld because met applicable statutory provisions permitting non-disclosure. further certify that earned income from outside employment and honoraria and the acceptance gifts which have been reported are compliance with the provisions U.S.C. 'app. SOI et. seq., U.S.C. 7353, and Judicial Conference reguliitions.